Environmental Health & Safety stays up to do date to ensure that you get the latest safety and environmental compliance information. Check here for the newest alerts. FIU Staff - Do You Know What Lockout/Tagout (LOTO) Is? Are You Affected By It In Your Workspace? Environmental Health & Safety (EH&S) launched an updated version of the “Lockout and Tagout” or “LOTO” Program. “LOTO” applies to operations where the unexpected energization of the machine or equipment could cause an injury to employee(s). This program provides safe work practices to effectively control the energy sources of equipment while performing maintenance operations. Please refer to this memo for more information on how this program may affect your area(s). If the LOTO program impacts you or your employee(s), or you are unsure, please take this brief survey. This will help EH&S identify if you need additional support. NOTE: The survey will not take more than a minute to complete. You can find historical EH&S events and campaigns in the section below. March 22nd - World Water Day! World Water Day is March 22, 2019 (Friday)! EH&S & other University departments and programs will be supporting the Office of Sustainability with their awareness event. It will be taking place at the GC Fountain, from 11:00 am - 2:00 pm. See the flyer for complete details, and please, come out and enjoy the day with all of us. There will be plenty to learn about our most precious resource, water! Lab Self-Audit Launch - August 15, 2018 - NOW LIVE! Environmental Health & Safety (EH&S) is kick starting the 2018 Laboratory Self-Audit (LSA) to continue to promote awareness of safety and regulatory compliance for the FIU laboratory community. EH&S is very appreciative of all participants that contributed to the success of the 2017 LSA. NEW!! The LSA Summary Reports for 2016 and 2017 are now available for review. Visit the Lab Safety Webpage to access the reports. The 2018 LSA is mandatory for all FIU research and academic laboratories to submit. Completion of the LSA fulfills the FIU EH&S requirement for the Annual Safety Inspections. NOTE: this does not include Special Hazard Compliance Inspections. The 2018 LSA will commence on August 15th and conclude on November 30th, 2018. The LSA Preview will be made available August 13th, 2018 & the links for the LSA Survey and the LSA feedback survey will only work during the scheduled time frame. For more information on the 2018 LSA (general information, changes to the format, etc. ), please refer to the memo. If you have any questions about the LSA, please contact Tamece Knowles (knowles@fiu.edu or 348-3387) or Victoria Leyland (vleyland@fiu.edu or 348-1331). EH&S is teaming up with Fisher Scientific, Medrep, and Health Environmental Services (HES) to host the EH&S Biosafety Seminar. In recognition of National Biosafety Month, the National Institute of Health (NIH) is encouraging institutions to focus their efforts on sustaining and enhancing a culture of safety and responsibility in life science research laboratories. EH&S will provide information and resources focusing on biosafety procedures, policies and safe practices. In addition, those who attend will earn 2.0 hours towards professional development/continuing education. If you encounter any issues with the calendar or reservation, please contact the Safety Education Office at 305-348-1421. 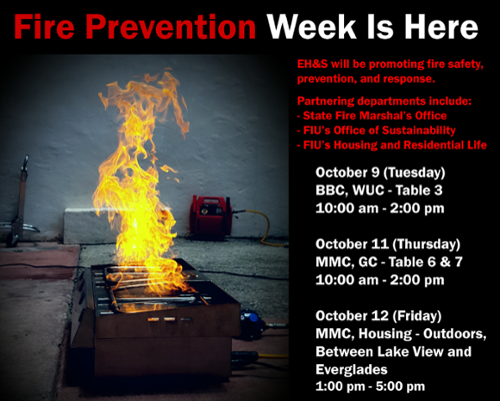 Fire Prevention Week is in full swing and we want you to come by one of our events to learn about fire safety, prevention, and response! The Department of Environmental Health & Safety (EH&S) is hosting the 2018 Lab Safety Roundtable on September 11th, 2018 from 10 AM to 12 PM in WC 130. EH&S will provide information on upcoming programs, safety initiatives, and regulatory changes that impact your areas. We request that all PIs and Lab Managers be present for this session. Lab Staff, Graduate Students, Interns or any individual that works in a lab space AND is familiar with lab procedures, processes, compliance, and safety issues should also attend. Please RVSP by clicking the link below, selecting the “I’m Interested” button, and logging in with your FIU credentials. For more information about the event, please contact Tamece Knowles at 348-3387 or knowles@fiu.edu. Polycom will be available for BBC attendees. Feel free to share the event invite with others. We look forward to seeing you there!!! If you encounter any issues with the calendar or reservation, please contact the Safety Education Office at 348-1421. With the summer months in full swing, the risk of bites and stings increases with outdoor activities. EH&S wants you to be aware of these potential threats and be safe while enjoying the beautiful South Florida summers! Please feel free to print or download this guideline to preventing bites and stings. As the summer months roll on in South Florida, so does the rainy season. During the rainy season, mosquito populations increase, along with the risk of mosquito-borne disease transmission. The Zika Virus has been a global concern, and in the past few years, has made its way to South Florida. Although reported cases of infection are extremely low and remain rare, Florida International University takes the threat seriously and is being proactive in its approach to preventing members of the community, especially its students, faculty and staff, from exposure by raising awareness.